Since you're visiting our website, you are probably thinking about building something now, or soon. Maybe you are thinking of new construction . . . building your dream home. Perhaps you are considering staying put and adding onto your existing home. Maybe you are learning all you can about energy-efficient living and want to know how to make your home more sustainable within your budget. Whether you have a residential or commercial need, the process starts with careful planning. Here are answers to some frequently asked questions we've received concerning the architectural process. We're always happy to hear from you if you have questions! Q: What does an architect do? A: An architect works for you addressing issues regarding site and construction, acts as a counselor on issues dealing with zoning and permitting, contractor selection and bidding, and offers advice during the construction process. Your architect will draw plans for your project and provide specifications that will help ensure the contractor pricing process goes smoothly. Special considerations may include historical district and environmental regulation issues. Q: What are the steps in architectural services? A: Services follow a logical pattern including: information gathering - measuring, program, site info., etc. 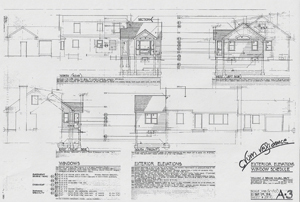 ; schematic design - several rough alternative layouts for the project's basic design, revised in response to comments over several meetings; design development - the agreed-upon design is refined, with final locations of components, dimensions, details; construction documents - drawings, specification information, fully detailed to the level planned, used for bidding, permitting, building; bidding/negotiation - site walk-through with contractor(s) answering questions, reviewing quotes with owner; field - visits during construction to review construction quality, deal with problems encountered, make any changes, select finishes, etc. Other services include unusual programming, representation at zoning or historical reviews, special detail drawings, extra field visits, as built record drawings, post-occupancy evaluations and many more. Q: How are services priced? A: Residential work is generally quoted on an hourly basis for design stages which can be open-ended. An estimated total for each stage is often included, but actual time can vary widely if design investigations become lengthy. Other phases usually have fixed amounts within stated assumptions of scope. Total costs can be a few hundred dollars for a one day visit to a couple of thousand dollars for some residential projects, and beyond for larger or more detailed or complex projects. A fee proposal is prepared for each project.